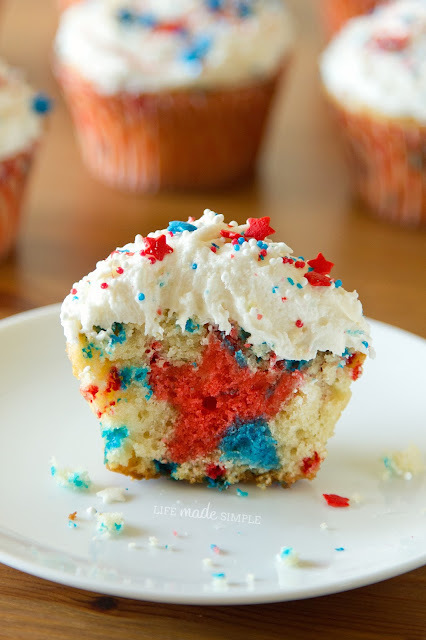 Patriotic Funfetti Cupcakes - Hi, friend Popular Recipes, in this article entitled Patriotic Funfetti Cupcakes, we have prepared this article well and concise to be easy to understand for you to read and can be taken inside information. hopefully the contents of the post Article 4th of July, Article baking, Article cupcake, Article food, Article funfetti, Article patriotic, Article recipe, Article star, that we write this you can understand and useful. okay, happy reading. I know what you must be thinking - this girl is obsessed with funfetti. Yeah, you're pretty much right :) The other day when I was at work, I was organizing our baking shelf and an idea for patrotic cupcakes popped into my head... funfetti with a surprise star in the middle! What could be more fun?!?! Since Stephen and I celebrated early (we went to a BBQ tonight), I thought it would be a great treat to take and I'd be able to share it with you just in time for the 4th! These are soft and moist vanilla cupcakes that are bursting with red, white and blue sprinkles. They've got a swirled star in the middle and are topped with a light and fluffy vanilla buttercream. These may not be apple pie, but they're pretty darn good and festive too! Happy 4th of July- enjoy the fireworks! 1. Preheat oven to 350 degrees. Line one standard cupcake pans with liners, set aside. Line the bottom of one standard size loaf pan with parchment paper, lightly coating it with baking spray and flour, set aside. 2. In the bowl of a stand mixer, beat butter and sugars until light and fluffy, about 3 minutes. Add vanilla bean paste, vanilla extract and almond extract. With mixing speed on low, add egg, then egg yolk, mixing until just combined. 3. In a medium size mixing bowl whisk together flour, cake flour, baking powder, baking soda, and salt. In a glass measuring cup mix together sour cream and milk. With mixing speed on low, alternate dry and wet ingredients, mix until batter is smooth and homogeneous (being careful not to over mix). 4. Remove bowl from stand. Portion out ¾ c. batter into on small mixing bowl, and ¾ c. of batter into another mixing bowl. Dye one red, and the other blue. Gently swirl the two together in the prepared loaf pan (don't go too crazy or you'll end up with purple). Bake for 15-18 minutes or until the cake is set. Once the cake has cooled, remove from pan and cut out star shapes (you'll want to use a small star, about 1" in diameter and ½"- ¾" thick/depth so that it fits nicely into the cupcake liner with room for the cupcake to bake around it). 5. Gently fold in sprinkles to the remaining "white" batter. Scoop a small bit into the base of each of the cupcake liners. Place a start standing upright into each, then pour the remaining batter around the start, just covering the top. Place in the oven and bake for 18-22 minutes or until the cupcakes spring back when touched and are slightly golden brown on top. 6. Remove from oven and allow to cool in pans for 5 minutes before removing and transferring to a wire rack to cool completely (about 25 minutes). 7. While cupcakes are cooling, in the bowl of a stand mixer fitted with the whisk attachment, combine butter, salt, and vanilla. Beat until fluffy (2-3 minutes). With mixing speed on low, add heavy cream, then gradually add ½ c. powdered sugar at a time until the mixture becomes soft but firm enough to hold it's shape. Beat frosting for an additional 3 minutes until light and fluffy. Pipe on cooled cupcakes as desired, decorate with festive sprinkles. Thank You and Good article Patriotic Funfetti Cupcakes this time, hopefully can benefit for you all. see you in other article postings.